I tried this deal out myself with a little tweaking! 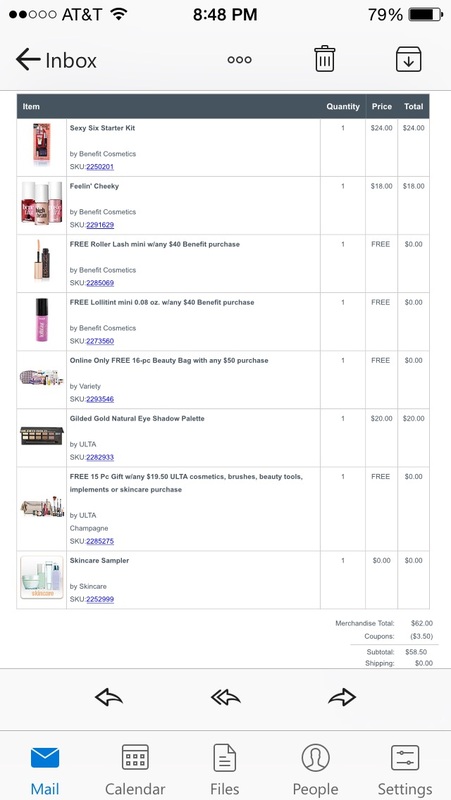 Just an FYI I’m a Benefit-Aholic! By Purchasing $40 in Benefit that qualified me to receive a mini Roller Lash Mascara and a Mini Lollitint. With any purchase over $19.50 of Ulta you are qualified to receive a Ulta gift bag with $88 in free products! Having spent over $50 it qualified me to get a gift with purchase, that includes $70 in samples!. Don’t forget the coupon for $3.50 off of a $10 purchase, use code 205730. Plus free shipping on any order over $50! Next Post Calling All Expecting & New Moms, Try Kiinde for FREE!